What is chef Gemma Tuley doing slumming it under the arches at Waterloo? Tuley is the head chef last glimpsed launching Foxtrot Oscar, Gordon Ramsay’s bistro in London. She has also worked with the excellent Mark Sergeant at Claridge’s and was given a term with the Guy Savoy organisation in Paris, a career-enhancing experience organised for her by Ramsay. As the only person in the kitchen who did not speak French, Tuley had to suffer the indignity of being pulled around by her pony tail when being shown what to do. She responded not by taking a crash course in French, but by cutting off her pony tail. Smart girl. So why is she here, knocking out £8.90 set meals after all that superior training? Not that there is anything inferior or second rate in turning out a good restaurant meal for under £10. On the contrary, such a thing takes enormous skill and must draw upon a deep knowledge of how to extract the best flavours from the most unprepossessing ingredients. It’s irrelevant anyway, as Tuley is not here today. Which is kinda worrying on the second week of opening, but we press on. Arch One is situated opposite the majestic front entrance to Waterloo Station, and has a view of urban architecture and city people that one could never tire of. The new owner, a wine importer, has taken over a rather tired old site under the Waterloo arches - a move that saves money as the kitchens and bar areas are already installed. But, you know, despite all the recycling, I don’t think it would have hurt to have spent a little more on cleaning the spackle of vintage blobs of blackened chewing gum from the floor. These Rorschach blots of slovenliness are rather unappetising, even for a cheap joint. 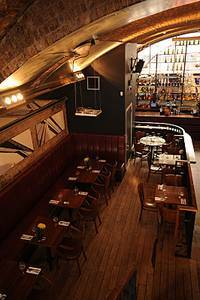 The ground floor is given over to a bar area, which is open 24 hours on Thursdays, Fridays and Saturdays. Upstairs is a dining room with leather club chairs, tablecloths and fresh flowers. The concept is good food for less cash, although there are only two other diners here today taking advantage of this bargain. We opt for the three course set lunch (with a glass of house wine) for a credit crunching lunching price of £12.90 plus service. Our lunch is composed of the following two meals. Menu 1; ham and cheese involtini, then lamb stew followed by fruit crumble. Menu 2; beetroot, parsnip and apple salad, then haddock with rocket, fennel and fig salad followed by cheesecake. It sounds good, if a bit school dinners. However, much of it does not look terribly good and the rest tastes downright awful. The involtini is pretty decent, I guess, served with a pleasant chopped tomato relish. The beetroots are dried out and have a weird, shiny chamois leather exterior. If you were ever to have a nightmare about Jordan’s sunburned buttocks, I do believe that these puckered beets would loom large. The parsnips are fine, as parsnips go, but what a weird combination - especially the cooked, over-ripe apples with a mixed salad dumped on top. It looks and tastes like someone is clearing out the fridge on a wet Sunday morning, not composing a nice salad for a downtown restaurant. 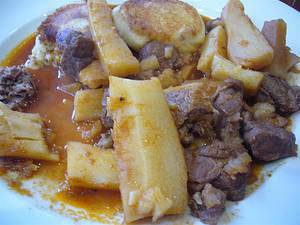 ‘Mind out, the plate is very hot,’ says the waitress, banging a microwaved soup dish full of lamb stew on the table. She forgets to mention that the food inside it is tepid. Have you ever seen such an unattractive dish? (see picture) The stew is somehow both fatty and dry; twin peaks of unique horror. It is ‘garnished’ with those parsnips again, and the double disgrace of two cold pats of potato. Nul points. The poor old haddock is dried out, the figs are tired and at least the rocket is nice and peppery. The fish is irredeemable. However, with a bit of care, this could be a nice autumnal salad, but not as it is executed here. Desserts follow on in the same theme of ill-prepared, slapdash food sent out to an empty restaurant at the wrong temperature. ‘Mind out, the plate is very hot,’ heralds the arrival of a square of dry crumble with cold custard. Then there’s the cheesecake. I suppose it’s a bit daring to have a ‘sweet tomato cheesecake’ instead of a lemon or toffee one. Yet despite the supposed culinary daring, it still ends up being a dense, sugary cake with a quarter of a clumsily caramelised tomato on the side. We only eat a little of this. In fact, we don’t eat very much of anything, as it is all so awful. This has not escaped the attention of the manager, whose attempt at rectifying the situation is hardly text book. ‘ Why did you send your cheesecake back? What’s wrong with it?’ he says, approaching our table. I didn’t send it back, I demur. I just didn’t eat it all. (Mostly because I don’t want to waste time arguing with someone like him). Note that when you order lunch at Arch One, you must state which dessert you would like. Perhaps this is because you might be tempted to order the cheaper, two course version after sampling the awfulness of the food. Service is a bit weird, not to say unhelpful at times. On the wine front, the house red that comes with the set lunch is not bad, but the white is like drain cleaner. The mysterious wine list tells customers nothing and only raises suspicions. For example, ‘Barbera £24.90’ (that’s a grape variety) or ‘Chablis £29.90’ (the name of a town in France) and even ‘Dom Perignon Vintage £125’ (what is this, guess the vintage?). What further proof do you need that cheap is not necessarily good? I feel like pulling Gemma Tuley’s pony tail myself. But then she is a young and talented chef, and I fear this mess is not her fault. 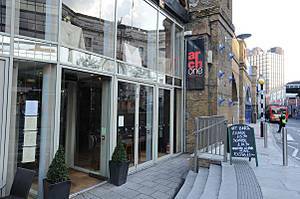 Arch One Bar & Grill, 1 Mepham Street, London SE1. Tel: 020 7401 2329. Lunch for two, including drinks and service, £30.